Welcome to my world where I try to figure out what I'm going to do next! 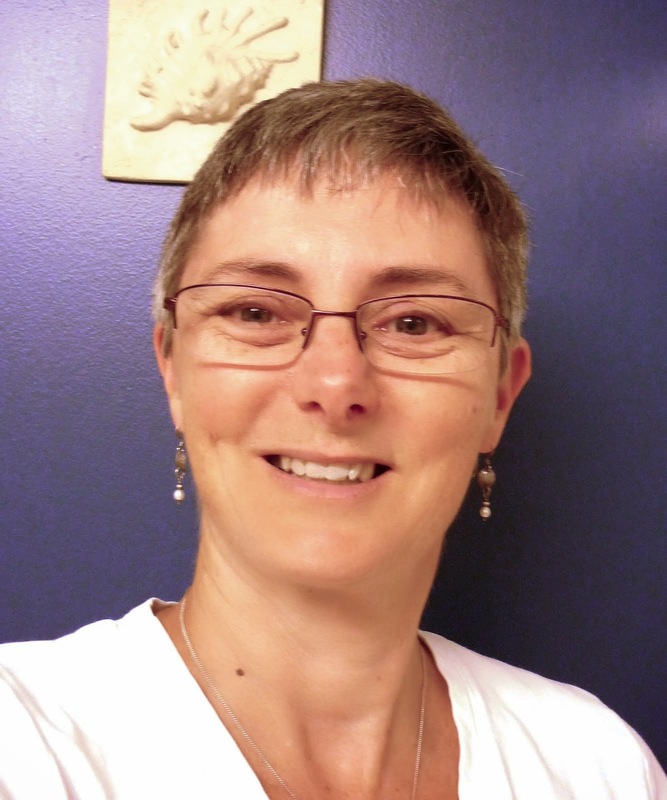 These days, it is mostly quilting, but you never know what it might be... come find out with me! 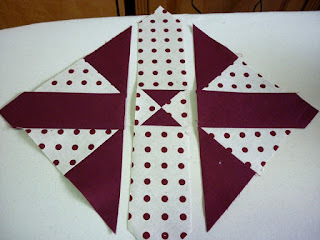 If you use this tutorial to make a quilt, I would love to see a picture! Disappearing 9 Patch and Disappearing 4 patch blocks are pretty popular and easy to do, giving you a very interesting result. At my "Little Group" of quilting friends here in New Westminster, we were given the challenge to use a disappearing 4 patch in a project, that we would show at our wrap up dinner in June. What a great group of ladies, and oh what fun we have! Thank you Colleen for coming up with this challenge. I thought I'd like to see what happened if I changed up the cutting pattern a bit. What do you think? I started with 6" squares - for each block you will need 2 squares of 2 contrasting colours. (I've chosen to work in linens). 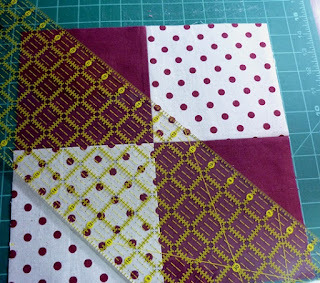 Stitch them together to make a regular 4 patch block. Now the fun part - instead of vertical and horizontal slicing, you need to do diagonal slicing. Mark 2" in from each corner, all the way around the block. I used a yellow pencil, but use whatever works and shows up best for you. The marks will be in the seam allowance. The cutting - this is where it is really nice to have a rotating cutting board, your cutting board on a table that you can walk all the way round, or use a small enough cutting board that you can turn it without disturbing any of your cut pieces, until you are finished all the cutting. Take your ruler and line up the top upper left mark with the right hand side bottom mark. Cut. The next cut will be from the Left side bottom mark to the Top Right mark. You will need to make 4 cuts in total to make all your cuts. The magic begins! 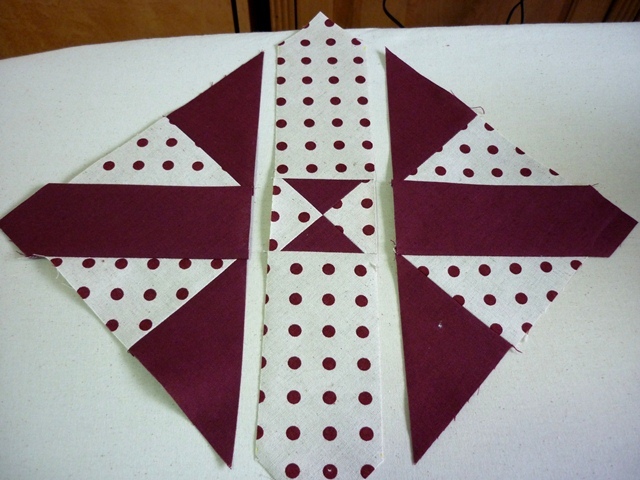 The next step is to pick up and replace the centre edge triangle with their adjoining neighbour so that the polka dot and solid pieces switch sides. The final step is to give that centre square a quarter turn. When sewing the three pieces together into your final block make sure you line up your centre seams as the outer edges will not necessarily match, butting those seams together snuggly. Square up your block and trim to the largest size possible - I was able to trim to a 9 1/2" square. I chose to make my squares into potholders, so I sandwiched and simple stitched in the ditch, and bound them by machine, with the finishing touch being adding grommets to hang them. 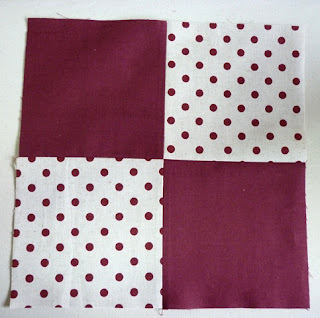 I've also got a plan to make a quilt using these blocks, but that is somewhere down the bucket list right now! Edit - If you use this tutorial and make a project, I would love to see a picture! 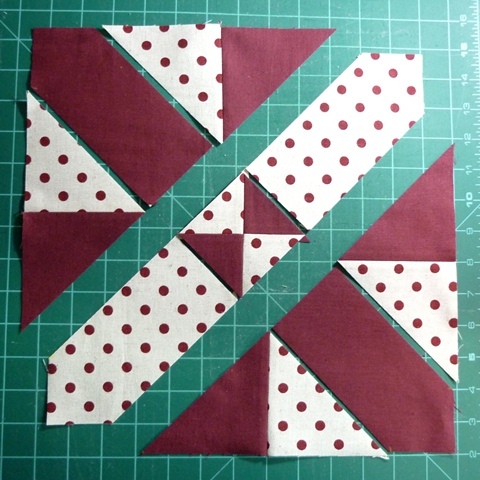 I've had a couple of questions about how far from the corner to make your diagonal cuts when using 5" charm squares. It is entirely a matter of personal choice - you could leave the cuts at 2" from the corners, or move them in a little closer. I would probably try 1 3/4" in from the corner and make a test block to confirm I liked the proportions. There really is no wrong answer! The following information was sent to me by Beverly - thank you! While I have not worked through the math, reading it through, the math seems to make sense. 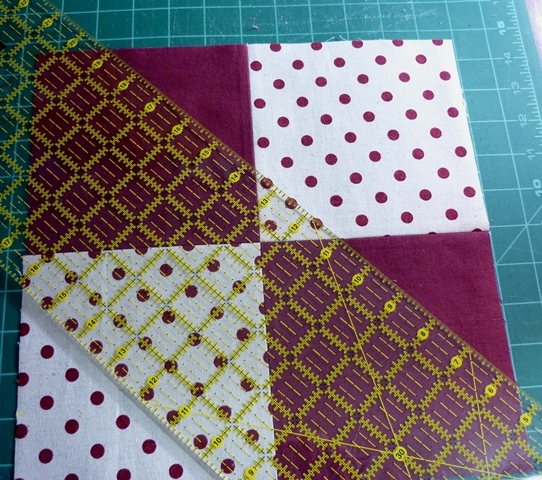 Make a sample block to be sure, but this could save you same grief and wasted fabric. Have fun! I'm trying to figure out the general formula for what size to start with to get what size finished block (w/o seam allowances). 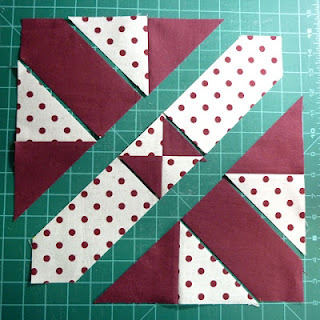 Since you are cutting each diagonal twice, you should lose twice the amount you would when making quarter square triangle blocks, right? E.g. you made a four-patch of 6" squares to get an 11 1/2 inch square. 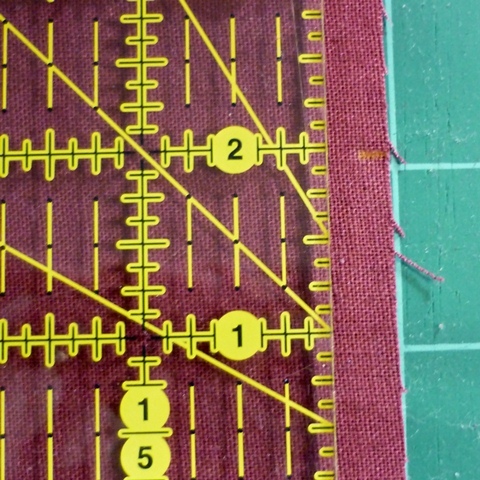 You lose 2 1/2" (2 x 1 1/4) to get a 9" block, or 9 1/2" with seam allowance. So to get an 8" finished block, you need a 10 1/2" four patch, which you would get by sewing 4 5 1/2" squares. 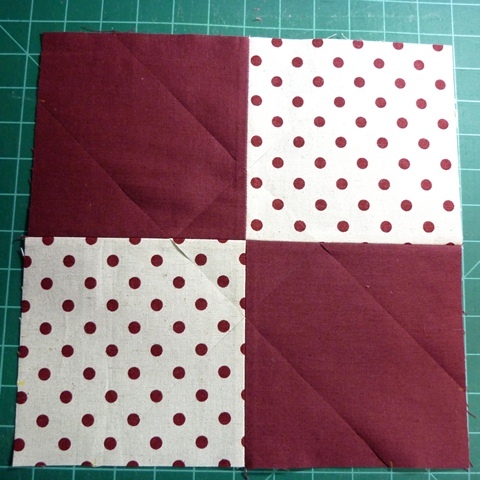 or similarly making a 9 1/2" four patch from 5" squares would get you a 7" finished block. A 12" finished block starts with a 14 1/2" four patch made of 7.5" inch squares, and a 6" finished block starts with an 8 1/2" four-patch made of 4 1/2" squares. 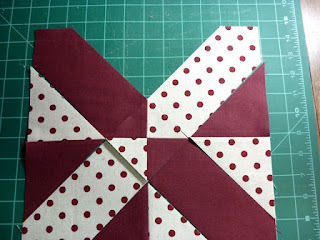 I really like the pattern that is created with these repeating blocks, and will get around to making it sometime! Knowing how many of you have pinned this tutorial, I'd really like to see what you've created with it! Great job Janet and thanks for sharing the process. Wow. I never would have figured that out, but I love the block and how it comes out. I really have to try it out. Thanks for the tutorial. Wow - disappearing is right! I love your twist! OMG!! How ingenious! Gotta try this out with all my Moda Charm packs!! I love it but that is some serious piecing!!! Fun idea and great tutorial! It would be fun to try out at quilt retreat! Brilliant! Thanks for sharing that. Amazing what you an do with a 4-patch. Very striking colours. Great tutorial Janet! And such perfect piecing and quilting you do! Thank you for the amazing tutorial. The finished square looks much more complicated. I plan to try this one soon! I made one right away, it's really very easy and with such great result! Thanks for sharing! Excellent variation> Great choice of colours. Great idea, I might have to try making some right away! Thank you for the explanations and pictures. Having finished a D4P quilt, now I want to do another this way! Really great idea. Thanks for putting it up. Hi Janet! 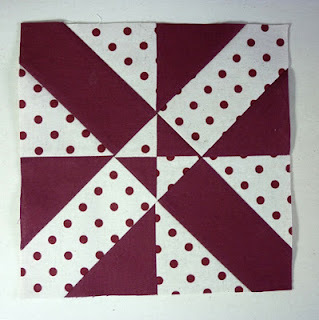 Love this block - I was directed to your blog from the Quilting Board I wish I had found you when I lived in Richmond BC not now when I am in Los Angeles Ca. Thanks for the tutorial I have some perfect fabric for this! Such a great block! I never would have figured out that it was made this way! Very clever. How very ingenious . . . so much more interesting than straight line cuts. I love this twist. I am wondering if you still mark 2" from corners if using different size squares. My aim is to use 5" charm squares from my stash. I have the same question! Any help is apreeciated. I'm thinking about making this into a much larger quilt. Very nice. Visually dynamic, but there's no way I'd do that with an entire quilt. Too many pieces. I'm afraid I'd get bored and it would end up in the UFO pile. However, it would be doable as a mug rug or pot holder. Call me lazy. Really great block!! So visual!! I'm in North Delta. What a fabulous way to 'twist' the four patch block! Thank you. I found it on Google :) I will certainly use that. 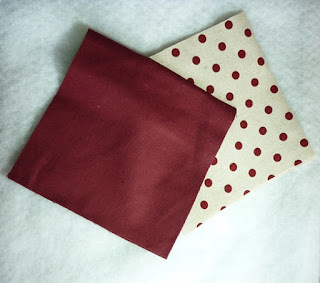 A great block for table runners too. Okay. So I used your block and put it onto my computer and it looks SO cool. However, I didn't get enough fabric to make the size I want in a full front, so I will be doing a "chain" of it. However, it will still look pretty neat. Once I get it done I will send a pic. Just got my squares done now. Just got my squares cut, and it figured out on the computer. Don't have enough to do a full front, but I am doing a "chain" of it. Hopefully I can do it justice! Wow I had just learned last week how to do the disappearing 4 patch using vertical and horizontal cuts but this one is sew cool. Could you post what a completed quilt looks like. That is so cool! Thank you for making this long awaited block so easy! Thanks for this nice tutorial. I love your blog title, "What comes next?" 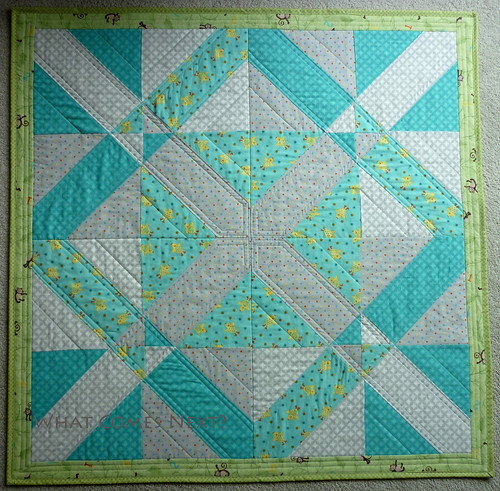 It's full of optimism and joy, which is what I get from quilting. I indulge myself and allow myself to have as many unfinished projects as I want, (usually more than 15) so "What comes next?" is often the first thing I ask myself when I have a few minutes in my sewing room. I have a spreadsheet on which all my projects are listed, so I've eliminated any guilt over projects I've forgotten. As long as it's on my list, it's just "in progress." Thanks again! I love it!!! It is fabulous ! What size squares would you use to make a 12 1/2" block? What size squares would you use to make a12 1/2" block? Hi Born in the 50's - you are a no reply commentoer, so I'll post here, which may also assist others. Hope you get this comment! To be sure that I have a larger enough block at the end to trim to a 12.5" unfinished block, I would probably start with 8" blocks to piece the 4 patch, although you could probably make it with a 7.5" block if you are careful and consistent. 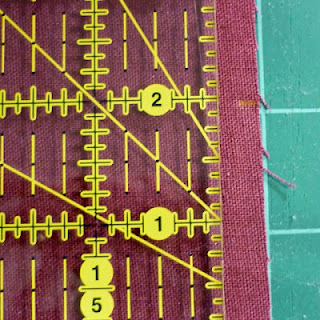 Please make a sample first to make sure you get the size you need, and to determine how far from the corners you want to make your diagonal cut - there is no "right" distance, it depends on the look you want. Closer to the corners will result in smaller hourglass blocks in the middle. Love this tutorial. Thanks so much! This is just great - thank you for a good, clear tutorial! Terrific tutorial for a very clever block. Love it. Thank you for sharing the tut! Its amazing, i loved the colours too. Just made this cute block. I really like the look of it, but there is a lot of Bias action going on. Don't stretch it when pressing and use LOTS of starch. Great block though and it was really quick and easy. Have you seen MSQC tutorial on the dissappearing 4-patch , also the 9 patch ?? I have finally got a picture of my quilt! I alternated your block and a 4 patch and LOVE it! Thank you for your tutorial. I continue to send others to your site! Now to figure out how to post the picture! Finished my D4P with a Twist! Now to post the picture! Thank you for allowing me to use your block and tutorial! I love this idea, and have so many 5" charms sitting in boxes ready for a project. The 5" charms make an 8" unfinished block. 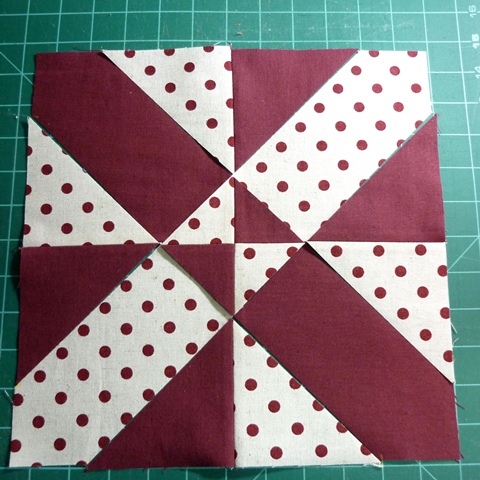 I'm making it very scrappy using 2 dark and 2 light squares for the 4 patch. I marked the corners at 1 34" which makes a nice block. The secondary geometric designs are interesting making it look more complicated than it really is. Thanks so much for posting this idea!Some machines say not to use metal bobbins. Have been told bobbins wear out too. However, I have never replaced any. I really like these disappearing blocks and am so glad I found this new to me version. Thank you! 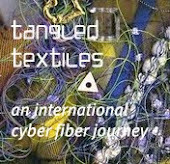 A fibre art group I was involved with.